Have you ever found yourself in the midst of working on a particular item in a Blackboard course only to realize that you should probably make the change on the same or similar item in another one of your courses? At this point you may start grumbling about the fact that you need to exit this course, go back to the My Courses module on Blackboard’s main page, scroll to find the course you were thinking of and then access it. Well, hold the grumbles, because there is a faster way to jump from one course to another in Blackboard. We give you the Course-to-Course Navigation Menu! From one of your courses, you can conveniently access all of the other courses you’re enrolled in. Select the Course-to-Course Navigation icon to access the menu and select another course title. If the same page you’re currently viewing in the course exists in the next course, that is where you’ll land. The most recently visited course is listed first. For example, if you’re viewing the announcements page in one course and select another course in the menu, you’re taken to that course’s announcements page. Here are the faculty development opportunities for April 2017. One of the of the hallmarks of student satisfaction in any online or web-enhanced course is a good student-course relationship. If the student has a good experience interacting with the course structure and materials, they are more likely to report a higher level of satisfaction. One way to increase the odds of a good student-course relationship is to be sure that when students check their academic progress, it is easy for them discover how they are doing in the course. Blackboard students and instructors have dramatically different views of course grades. Instructors generally interact with student grades via the Grade Center, whereas students work with a custom My Grades tool that only shows them their own achievements. Students do not get a spreadsheet view of their grades. Instead, they see a list of graded items in whatever order the instructor happens to have them in Blackboard’s Grade Center. When adding assignments and activities during any given semester it is easy to just set-and-forget the Grade Center and forget about how students see their grades. The good news is that there are steps that any Blackboard instructor can take to ensure that the students’ view of their academic progress is easy to understand and in the correct order. 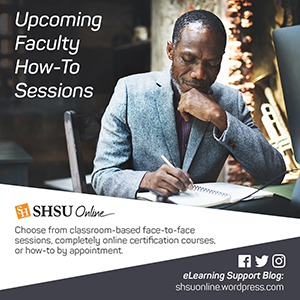 The following video capture by SHSU Online Instructional Designer Jay Wilson will walk Blackboard Instructors through the process of organizing the Grade Center using Grade Book Due Dates and Column Organization.